Barcelona Photoblog: Catalan Modernist Ceiling at Hospital de Sant Pau to Celebrate Barcelona Photoblog's 2.000.000 visits! Catalan Modernist Ceiling at Hospital de Sant Pau to Celebrate Barcelona Photoblog's 2.000.000 visits! 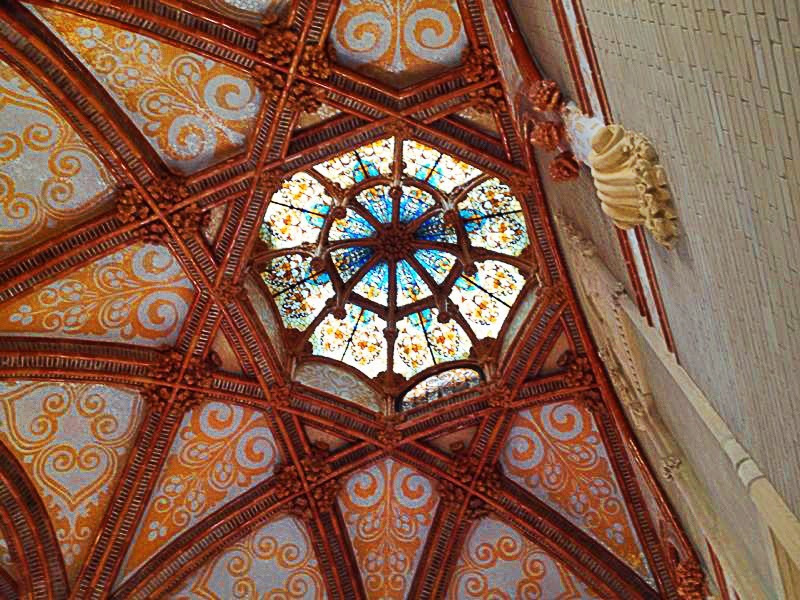 This is one of the ceilings inside one of the many pavilions in the modernist complex at Hospital de Sant Pau. All buildings have been restored and opened to the public inside a complex called Recinte Modernista. Now a small fee is charged to enter and admire these beauties reborn. This and other pictures I have, were taken with a cellphone and do not make justice to the real thing. The impression I get when I take a look at the result of such magnificent restoration is that everything has turned back to be like brand new, as if the hands of the skillful craftsmen had been working on those mosaics and those stain glasses yesterday. A whole range of architectural wonder has been unveiled for all the world to see. Update: In 2017 Barcelona Photoblog reached almost the 3 M figure but I decided to stop using the website that kept track of my visits. Two million visits is quite an achievement. Congratulations. I hope you keep blogging. Thanks Gerald and Oakland Daily, that's very kind of you!